Autobots, roll out... of bed! 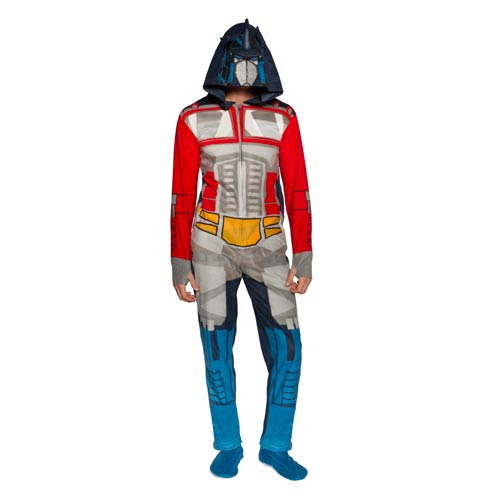 The Transformers Optimus Prime Hooded Unisex Onesie with Thumb Holes and Removable Feet will have you looking just like the Autobot leader while still being super comfortable! This adult onesie features a hood with Optimus' face, thumb holes for those cold hands, and removable footies for ultimate comfort! Show your love for Transformers, even while lounging! Ages 17 and up. Height 4'11" - 5'3" 5'3" - 5'7" 5'7" - 5'11" 5'11" - 6'2" 5'11" - 6'3"